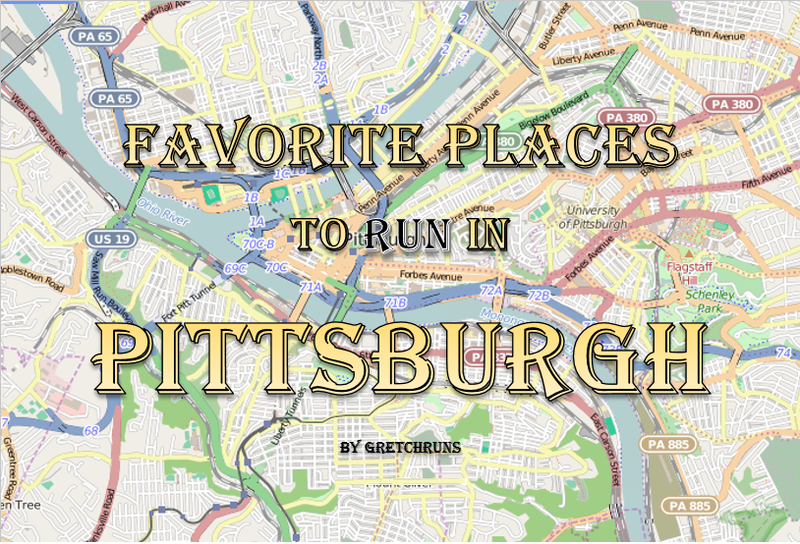 Today's post is inspired by a fellow Pittsburgh runner and blogger who asked me where I liked to run in Pittsburgh. I grew up on the Northside, moved downtown for a few years, and now live in the East End, so I've run in a variety of places. Here a few of my favorite routes, along with directions and some tips for each place. 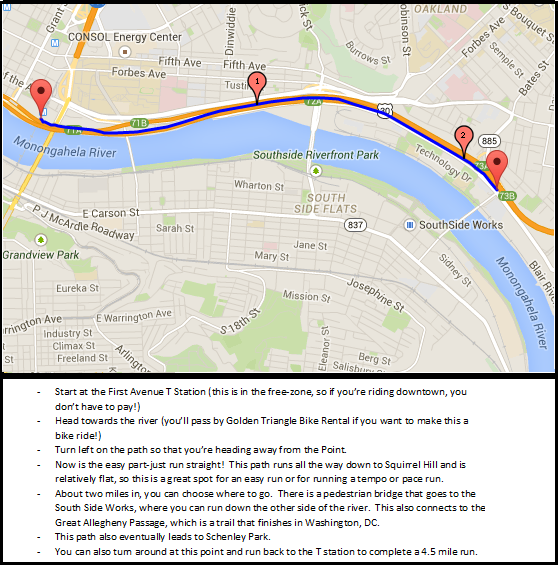 I hope this is helpful if you're either visiting Pittsburgh, or looking for a new place to run. Enjoy! 1. Riverview Park- 3.5 miles. Pittsburgh has 4 city parks, and Riverview is the one I'm most familiar with. This park has tons of trails as well as a 2-mile loop that is paved and has a walk/run lane. This is one of the more secluded parks, so you never have to worry about finding a parking space. 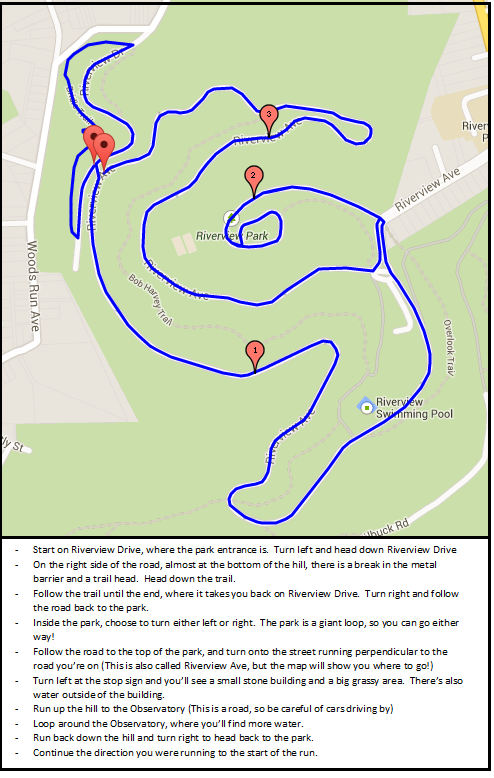 I grew up running on the trails here, so if anyone's interested in a more in-depth post about Riverview, let me know! 2. Brighton Heights loop- 5.5 miles. Growing up, this is what I would always do for a long run with my dad and sister. 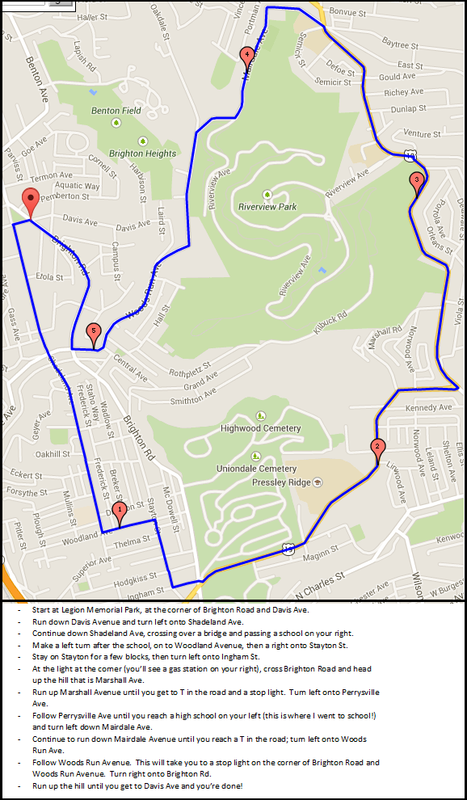 It is a challenging course with lots of hills, especially going up Marshall Avenue. 3. Eliza Furnace/Jail Trail- 2.5 + miles. Although the name of this trail is ominous, it's a really great, popular path. It's used heavily for commuting from the East End to downtown, but is also used for running. It connects to a few different trails, so the possibilities are endless if you run here! 4. River Trails- 3 miles. 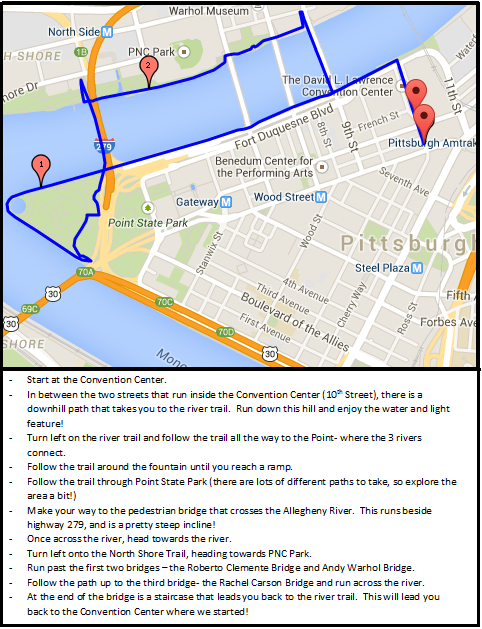 Pittsburgh has 3 beautiful rivers, along with a great system of river trails to run, walk and bike on. This is a loop I used to run all the time, but the trails continue on for miles in direction, so the sky is the limit! If you're vising Pittsburgh and staying downtown, I would highly recommend checking out the trails, in particular the North Shore trail. For more information, check out this awesome interactive map from Friends of the Waterfront. 5. Squirrel Hill loop- 4 miles. Now that I live in Squirrel Hill, I love to explore the neighborhood. 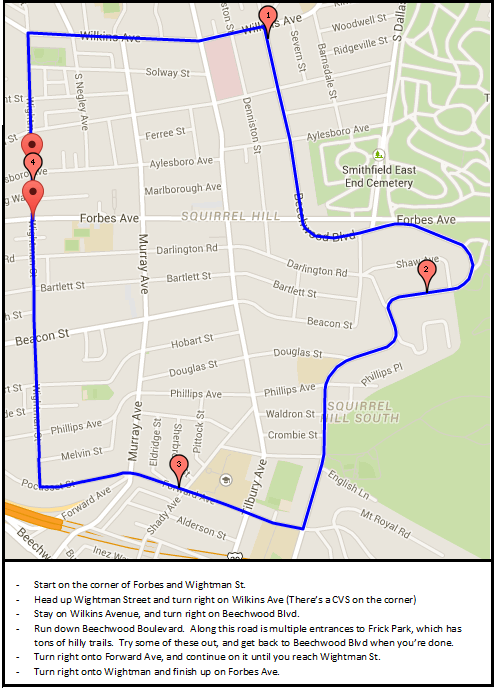 This is a simple loop, but you can easily switch it up and run on any street around it to add more distance. I think of this as a mini house-tour of Squirrel Hill, because there are some beautiful, old houses in this neighborhood. If you're visiting Oakland, I would highly recommend running over to Squirrel Hill and stopping in a coffee shop on Forbes as a post-run treat! 6. Schenley Park- 3 miles. 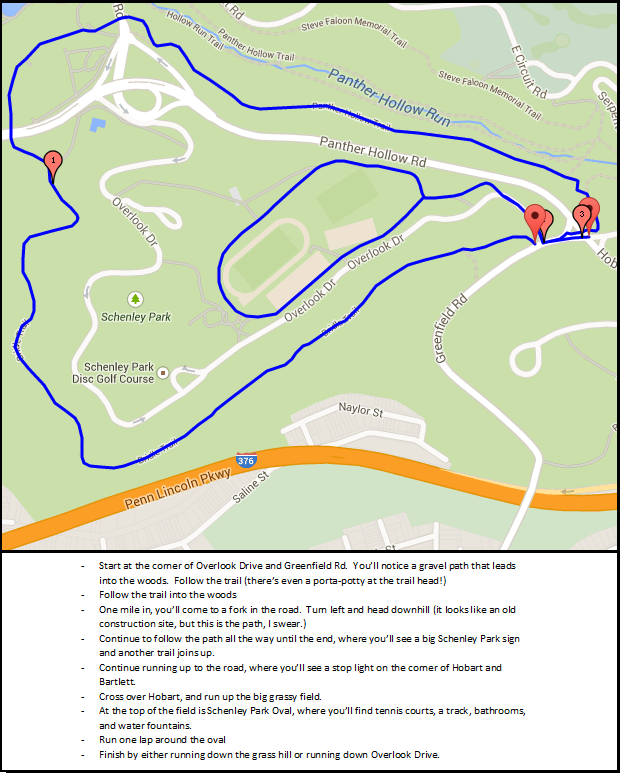 I have great memories from Schenley, because that's where my middle school and high school cross country course was. This path is very popular and is always full of fellow runners and walkers. There are lot of trails that split off of this main one, and one even leads down to a small lake that is beautiful in the spring time. The Oval is also a great place to get in some speed work and is equipped with a running bathroom and water fountain. I love this park! 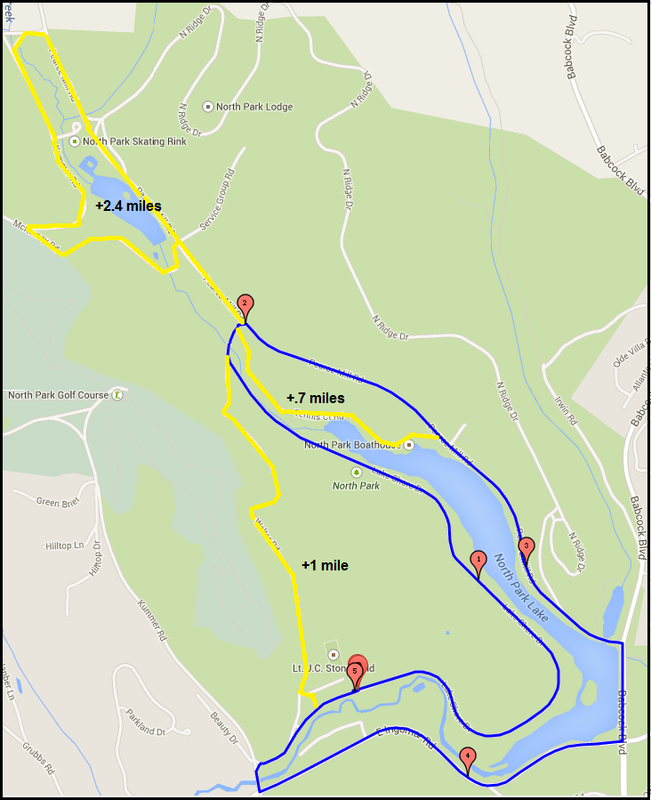 In addition to these routes, I also like to run at North Park, which is extremely popular in Pittsburgh. The main route is a 5 mile long route, and is highlighted in blue above. In yellow, I've added three variations that you can add for more mileage, along with their respective distances. There are two running bathrooms, each 2.5 miles apart from each other, as well as porta-potty's along the route and tons of water fountains. There are races here practically every weekend starting in the spring, so make sure your car doesn't get blocked in if a race is about to start! Where are some of your favorite places to run? Great post! I'm always interested in finding new routes, so this is great! I would love a more in-depth post on Riverview Park. We take our dog on walks there, and I swear we always get lost! Wow so happy to see this post. I need to add in new running routes and I didn't hear half of these despite me living in Pittsburgh! Thanks Shaun! And thanks for inpiring this post (hope you don't mind I linked your blog). Where do you go for your sq hill loop? I'm always looking for new places to go near my apartment! Great post! I've probably run all those routes at least once or thrice. :) I really like running the Southside trail -> Great Allegheny Passage out past Sandcastle and through the Waterfront, etc. It's so nice in the summer and fall. I can't wait until the weather is nice enough and it's clear to run again.